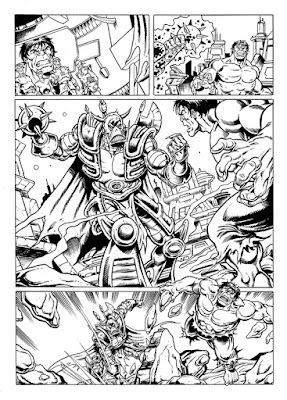 Simon Williams Comic Artist: Death's Head RETURNS! For the past month or so, I've been making hints on both my Facebook and Twitter accounts in regards to a certain project that I've been working on... a project which I truly believe is the most exciting thing I've worked on since breaking into the comics business in 2003. Yes.... Death's Head is BACK!! The original Freelance Peacekeeping Agent is returning to the pages of Marvel UK (for the first time since 1991 I believe?) 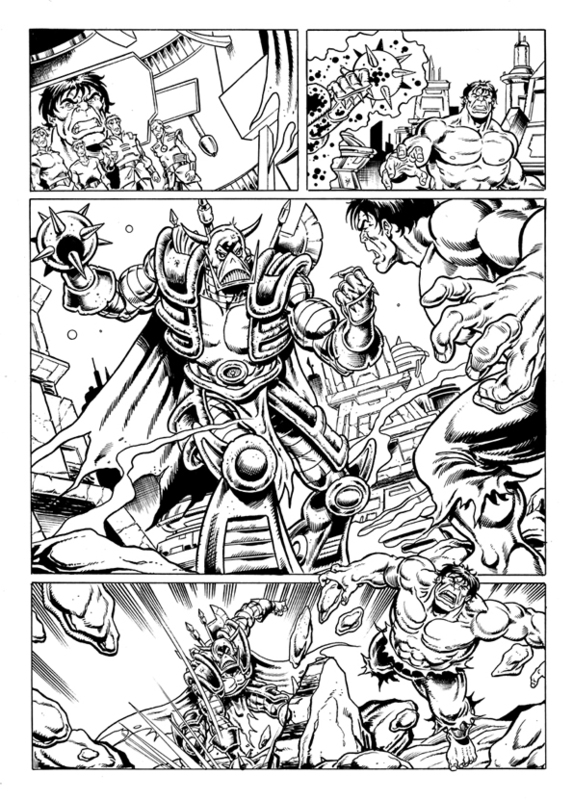 in the pages of Panini Comics' MARVEL HEROES... in a tale written by original Death's Head creator Simon Furman, with art by yours truly (and is the second part of a two-part story, the first part written by Ferg Handly with art by John Ross. Death's Head grand entrance however isn't until our part of the tale!!!). Now, it's no secret that I've been campaigning for the return of Death's Head since I broke into comics... so I can't begin to tell you how excited and proud I am to be part of this. And you know what the icing on the cake is? Death's Head will be fighting none other than THE INCREDIBLE HULK!!! Yes, a story which I wanted to see so much that I drew it up myself (as part of my SOULMAN INC SKETCHBOOK) is now a reality. Honestly, my job could never get any better than this, and I want to say a big THANK YOU to Ed Hammond and the guys at Panini for making this happen. I know for sure that a lot of Marvel UK and Transformers fans out there are going to be very pleased with this news!! So there you have it: MARVEL HEROES issue 33, available 24th March. Death's Head is back... and it's about time, yes? Way to go Simon! On behalf of the legions of DH fans, thank you so much for your continued persistence in pushing to get DH back on the printed page again! And with Simon Furman co-writing too boot! Too awesome for words! Can you drop us a hint as to if there's a story reason for DH being in his original TF gear or was that simply the writer's/artist's/editor's preference? Again, excellent news and thanks so much for all your hard work! Can't wait to see the finished piece! In regards to why Death's Head is in his original TF gear, we did discuss what he was going to be wearing (I originally thought it was going to be his blue uniform, which he wore for the most part when co-starring with Marvel Universe characters). The decision was made though to use his original green TF gear... as that seems to be the most popular among fans. As for how you can get to read this story, believe me I'd love to be able to help all you readers overseas! However, this IS a possible solution: MARVEL HEROES editor Ed Hammond has said that if you guys write to or email Marvel Comics US, and ask them to reprint this strip.... that if there is enough demand this story could be reprinted in a Marvel US title (which I believe are distributed in New Zealand?). So that is your best bet... honestly, if Marvel US believe there is a demand for the character, you never know it may lead to not only this strip being reprinted, but more appearances for our favourite Freelance Peacekeeping Agent (like in the pages of last years brilliant S.W.O.R.D series, written by Kieron Gillan). If you could please help spread the word as well... you never know what will happen! This is fantastic news. Well done Simon :) I can't wait to read ol' DH again. I'm sure this is only part of the beginning of the son of Lupex getting more print time. Two officially published tales in two years is good going for him. Sledgehama, where abouts in NZ are you? I'm back and forth there all the time (mostly Dunedin). Maybe I can bring you a copy across. feel free to msg me on my blog. Thanks Chris! I can see from your blog that you are a huge Death's Head fan!! I especially love the Lego Death's Head... awesome stuff!!!! I'd buy one of those!!! Hi, just found out this happened. I don't really follow comics enough to pick up on these kinds of things but a bit of Deaths Head/Transformers nostalgia-googling turned this up and it made me smile - now I have to try and find a copy! Glad to see him back in the green armour and glad to see others loved the character as much as I did as a kid. Kudos for keeping tin-head alive yes?